Pensive clever hipster girl in trendy outfit and eyeglasses enjoying reading a novel while sitting on the floor cross legged at home. Thoughtful young blue hair woman in spectacles reading a book over bookshelves background. Dolly shot. Slo mo. Thoughtful hipster girl with blue hair and eyeglasses lying on her back on the bench and reading a book at university library. Trendy female student preparing for exams as she lies down on the bench with her head propped on stack of books. 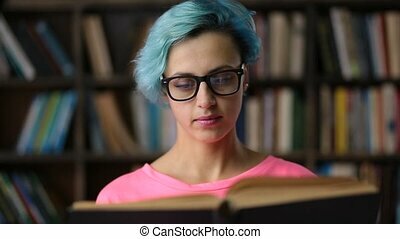 Smart confident blue hair nerdy woman in trendy spectacles absorbed in reading a book in university library. Another student searching for books on the background. Portrait of concentrated college student studying hard preparing for exam in library. Overworked female student napping while reading a book in university library. 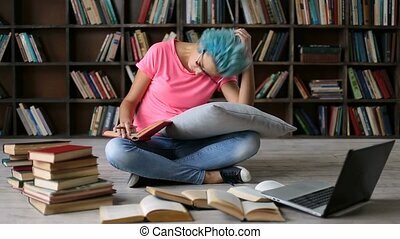 Tired hipster girl sitting cross legged on the floor, surrounded by many books, preparing for exam. Exhausted college sudent falling asleep as she studies in library. Charming young hipster woman with blue hair searching for a book in bookstore. Young cheerful woman buying books in hard cover in bookstore. Stunning female student in stylish clothes and eyeglasses selecting a book from a bookshelf. 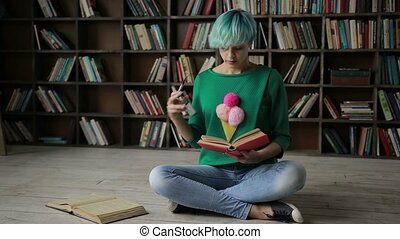 Depressed college female student with blue hair surrounded by books sits on the floor cross legged. Frustrated hipster girl with eyeglasses on her head studying complicated material in university library and preparing for exam. 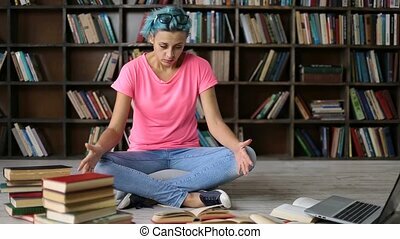 College female student sitting on the floor cross legged with a book, tired and exhausted preparing for exam. Hipster girl in trendy eyeglasses surronded by books studying hard in university library, reading a book and making notes on laptop. 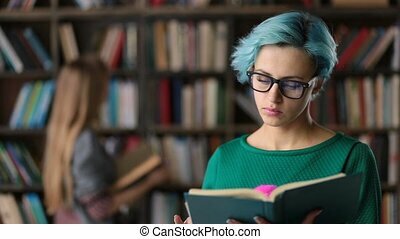 Attractive hipster student with blue hair in stylish eyeglasses reading a book in library. 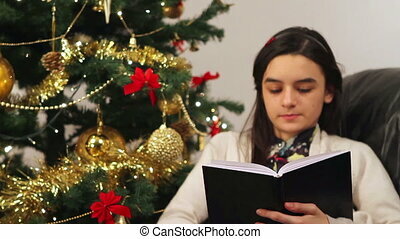 Portrait of serious female college student reading book over library's bookshelves background. Gorgeous nerdy college female student in trendy eyeglasses reading a book in university library. 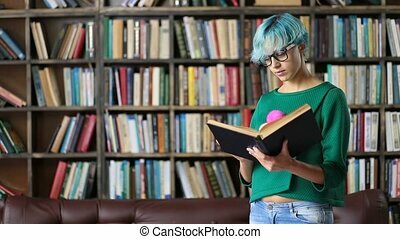 Young hipster woman with blue hair researching in library. Serious student preparing for exam. 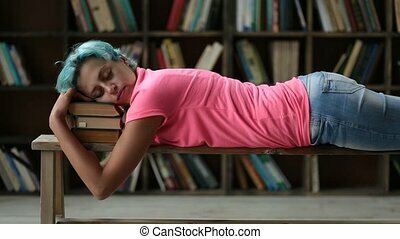 Charming hipster girl with blue hair sleeping on a pile of books in library. Side view. Exhausted of studying college female student napping on stack of books after reading tutorial material in university library. 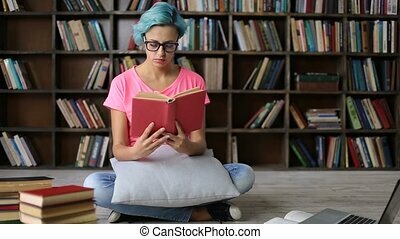 Charming nerdy woman with blue hair in spectacles sitting in lotus posture reading a book over bookshelves background. 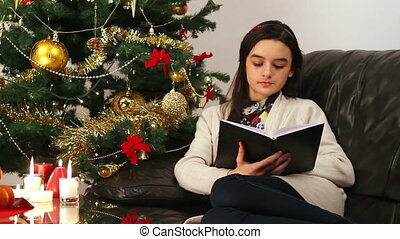 Attractive hipster girl with a book sitting cross legged, looking away thoughtfully and adjusting eyeglasses. Dolly shot. Slo mo. 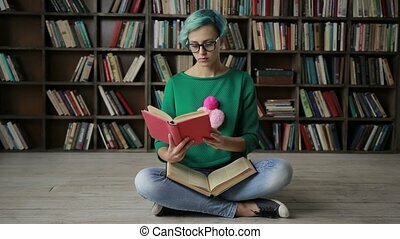 Young college female student in spectacles looking for a book on bookshelf in library while standing on wooden stepladder. 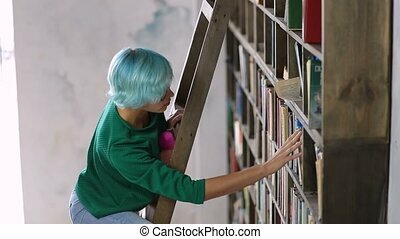 Charming hipster woman with blue hair standing on ladder at bookshelf and picking the book. 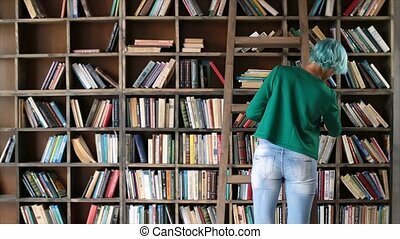 Smart hipster nerdy girl selecting new literature book from bookshelf in bookstore. Rear view. 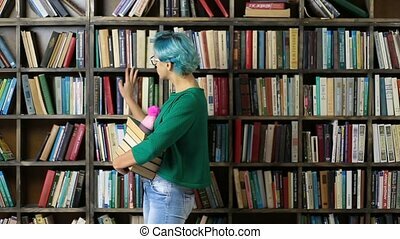 Young blue hair woman in trendy outfit standing and choosing book from shelf in library.